Timelines offer students the ability to visually process overlapping and chronological events in history, relating them in a way that is more difficult to perceive through reading. 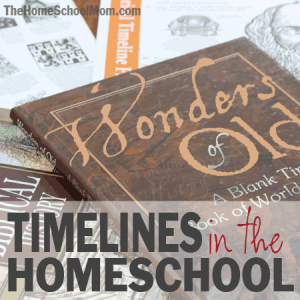 Timelines in the homeschool are a valuable tool to relate subjects together and view historical events as interrelated. “It is one thing for students to learn about isolated historical events, but quite another to understand the interrelation of those events throughout time. In order to help students grasp the scope and influence of events throughout history, as well as how those events have impacted the flow of history and the nature of the world as it is today, a historical timeline can be indispensable.” Rebecca Capuano explains how timelines bring history together and explores some of the best resources for creating a timeline. Terri Johnson of Knowledge Quest Maps shows how to easily make a timeline in book, wall, or digital form. Samples are available to view that can give you ideas to create your own notebooking timeline templates, or you can buy the complete download for $6.95 which includes: Spines for your notebook, cover pages, title pages, dividers for special topics like daily living, government/politics, religion/philosophy, science/technology, & more, books read & resources used templates, vocabulary page, timeline pages (in multiple formats), and 2 sets of different themed bordered notebooking templates. If you use a timeline and have any questions about where to place a figure in time, this site is bound to have the answer. Hundreds of timelines arranged by subject should cover just about anything you are studying.